Two friends tagged me for the Five Day B&W Challenge at about the same time. I'm going to participate, but it's going to be on my own rules. The canonical rules for the Five Day B&W Challenge are that you post a B&W image every day for five days, and that with each post, you tag someone new to also participate. First and foremost, I have no idea what the original motivation for this challenge might have been, but I will use it as an opportunity for personal growth (see also, Ad Hoc Challenges and Personal Growth). I will spend more time on each image than I typically do, and I will attempt images that I find difficult to deal with. Hopefully, I will learn new techniques to deal with some of the challenging images that I might otherwise pass over. At the same time, I will not necessarily post a images on consecutive days. If I haven't figured something out, I will invest the time to get as far as I can before posting the result. Second, I will not tag or nominate anyone. It's not for me to decide who needs what kind of photographic growth. That said, I hope that this post inspires you to challenge yourself somehow. That challenge may be by working up images in B&W, or by working them up in color, or perhaps by not working them up at all — by aspiring to achieve a better image in the camera, and to do less of that work after the exposure has already been taken. Finally, I will share the original image with each post, and I'll go through the retouching steps I used to produce the final image. So even if you don't choose to participate, hopefully you will still learn some of the same things that I'm learning. Nearly all of my work is done in some combination of darktable and GIMP, and this series will be no exception. Also note that one of my personal ethical principles, given my coming-of-age in a journalistic environment, is that I don't make local adjustments. Everything I do applies to the entire frame. This means that I also don't dodge or burn, which processes many photojournalists consider to be okay. 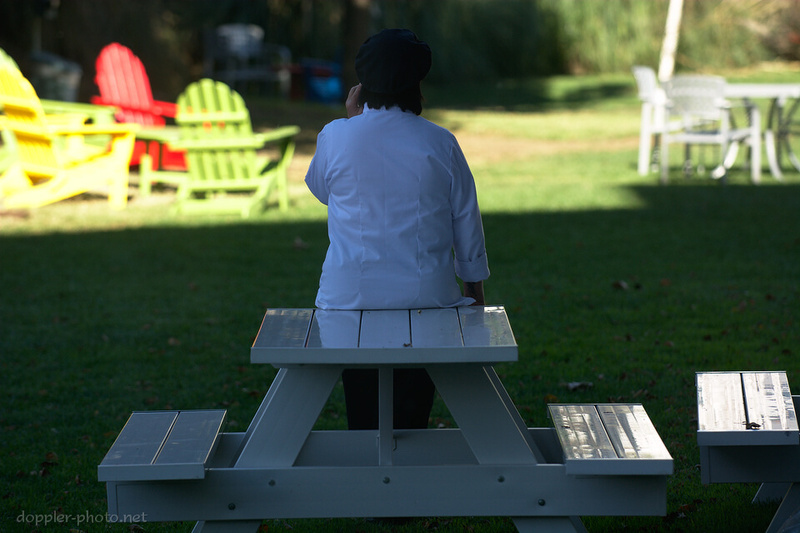 First and foremost, when I noticed this moment, one of the things that drew me to it was the inherent symmetry of the chef sitting against the picnic table, with the creases in her jacket mirroring the gaps in the tabletop. I know that I'm no good at nailing the horizon, and I didn't want to miss the moment, so I specifically left some room around my desired composition so that I would be able to get the horizon perfect in post. In darktable, I first tried converting to B&W with the Monochrome module, but I ended up switching the Color Correction module and just set Saturation to 0. At that point, I found that I had difficulty maintaining contrast _both_ between the chef's left arm and the bright background, as well as between their head/hat and the dark background there. That was the most challenging aspect of working this particular image. The first half of the solution was to use Tone Curve to blow out the entire sunny area. I put a control point at the top, a little over halfway to the right. 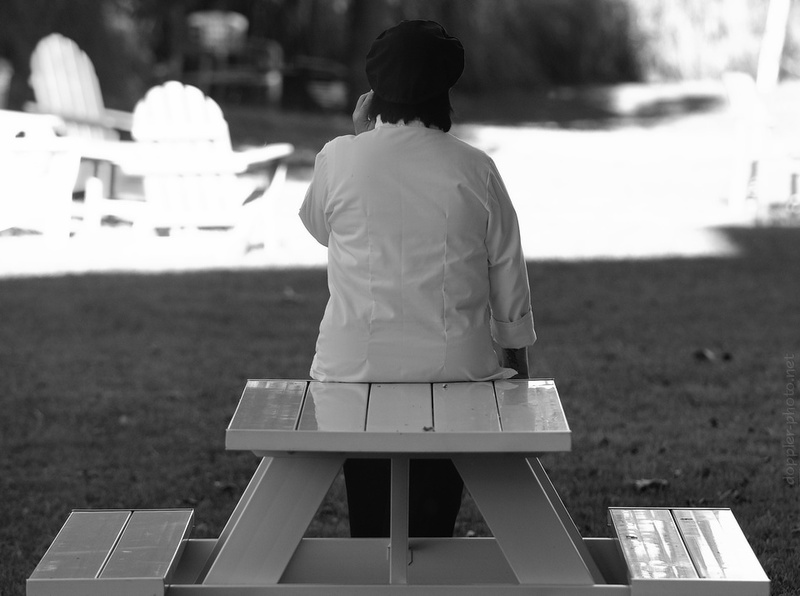 This forced all of the lightness values about 60% or so straight to 100%, and gave me some more room for contrast between the chef's jacket and the sunny area. Then I added a control point along the steep upslope (at about 30% input lightness) and tweaked it to adjust the contrast between the chef's head and the medium-brightness background. Et voila! To finish, I pulled the image into GIMP, sharpened it with the Refocus plugin, added the watermark, and called it a day.